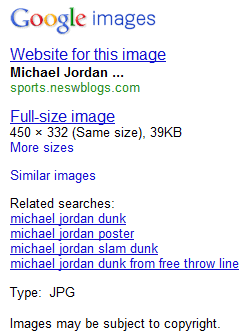 Google's image search engine started to show additional information about photos after clicking the results. The landing page's sidebar includes EXIF data: camera, settings, focal length, flash usage and exposure bias. "Additional details are found from within the image file, often saved there by the digital camera that took the picture or the application that generated the image. This data can also be manually added or changed after the image has been created. Google doesn't create or change this data in images created by others. The data is saved using the Exchangeable Image File Format (EXIF) specification and can include details about the type of camera that took the image, the camera settings (like aperture, focal length, exposure length, and flash settings), and the copyright and usage rights associated with the image by the person who created or edited the image," explains Google. Another change is that you can click "more sizes" for other versions of the image and "similar images" for visually related images. The sidebar also includes the search result's snippet. Google should also add links to the previous and the next search result so that you don't have to go back to the list of results. Their customer service stinks to high heaven! @Jonah: Doesn't matter anyway, it *was already there*. If your EXIF is generated by a GPS-enabled device then there's the risk that a photo reveals more than you'd like it to. True, it's already there, but it's not generably searchable. The question is: will we be able to search for images by GPS coordinates, or to specify EXIF tags to search? If so, well, my camera embeds its serial number in the EXIF info ... so any photo I've taken will be revealed by this. There are privacy ramifications, certainly. You can opt to remove EXIF info, of course, when you render out your images before upload ... but it's too late for those images which weren't searchable via this information prior to knowing that they're going to index it, nor is it reasonable for people to remove EXIF info generally, as they have no choice about it being embedded nor do they even know it exists. Google Image Search doesn't show information about location in the sidebar and you can't filter the results using data from the EXIF tags. Picasa Web Albums lets you pick a camera model and restrict the results to photos taken with that digital camera. What about displaying copyright information, since it is an EXIF tag too? Please Google! 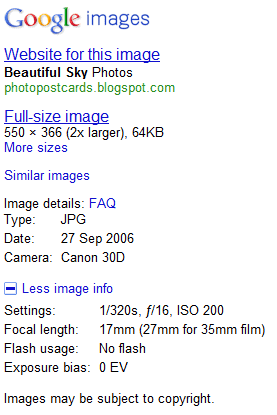 I would like to see Google publish ALL the EXIF data and make it searchable. With this new feature it's a good idea to wipe out metadata in some cases, with utilities like this EXIF remover - to not disclosure unwanted information. I mean geodata, date&time of taking a photo, etc. Stop it, Google! STOP!!! not good!!!! I have used the option "More Sizes" & it provided me with images of better quality. I think this feature would be used very wildly by many people. Is there a proper api to access the google image search output .... the one I could find seems to be deprecated. You can try http://photosearch.crazydroid.com it search Flickr for Exif data.